Picture of Niall Docherty having a shot at goals. Picture by Kenny Elrick. The result knocks Brora off joint top spot in the Highland League with Steven Mackay’s side now three points adrift of leaders Cove. Locos goalkeeper Andy Reid, who saved a Kyle MacLeod penalty during a man of the match performance, said: “At the penalty I tried to stand up and dive as late as I could and I was lucky enough to get down low and get a hand to it. “I had another save in the second half from Neil MacDonald when I actually stumbled and just managed to get back in time to turn the ball over the top. Locos midfielder Neil McLean made his first start for a couple of months, having recovered from a broken bone in his foot, while Brora Rangers player-manager Steven Mackay flew in to Aberdeen from a business trip to Milan to take his place but fellow forward Paul Brindle, missed out through illness. Inverurie defender Ryan Broadhurst captained the hosts on the day of his testimonial dinner. 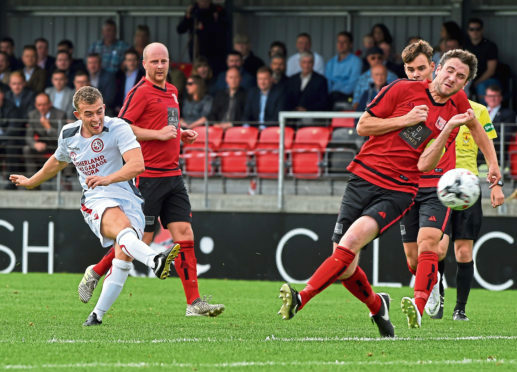 There was an early chance for Locos striker Joe McCabe when he raced through and bundled Brora keeper Joe Malin over as they raced to meet the ball. With only 14 minutes elapsed, Brora were awarded a penalty when striker Kyle MacLeod went down following what appeared to be a fairly innocuous challenge from Chris Herd. But the home side felt justice was done when Locos goalkeeper Andy Reid dived to his right to tip away MacLeod’s well-struck penalty. Locos were reduced to 10 men with only 25 minutes on the clock when Joe McCabe was shown a red card for a reckless challenge on Brora left back Ally Macdonald. Good play by Brora winger Niall Docherty set up a chance for Mackay but his spectacular overhead kick from 10 yards out flew over the top. After the break, Inverurie Locos manager Neil Cooper made an extremely positive move by replacing defender Chris Herd with attacker Chris Angus and reverted to an attack minded 4-3-2 formation. The change had an immediate impact with Locos awarded a penalty four minutes into the second period. Colin Williamson, having already been booked, was penalised for a foul on Mark Souter while attempting to defend at a corner kick. Referee McFarlane sent him off for a second bookable offence and Gauld made no mistake from 12 yards, smashing the ball past Malin with a ferocious spot-kick. Brora’s MacLeod went down under a Connor Rennie challenge in the 72nd minute but this time referee MacFarlane booked the attacker for simulation. Locos stopper Reid produced more heroics a minute later with a brilliant tip over the crossbar from MacDonald’s superb 25-yard strike. Sixty seconds later, Brora were reduced to nine men when Docherty was red carded for denying Gauld a goalscoring opportunity. The striker took the 22-yard free kick himself and lifted the ball over the wall and beyond the diving Malin for his 14th goal of the season. Seven minutes from time, Gauld really should have completed his hat-trick but he blazed high over the crossbar from only six yards out. In the dying embers, only a brilliant acrobatic save from Malin stopped Stuart Duff from adding a third for Locos. Brora forward Zander Sutherland said: “I think the referee ruined the game with a couple of terrible decisions.